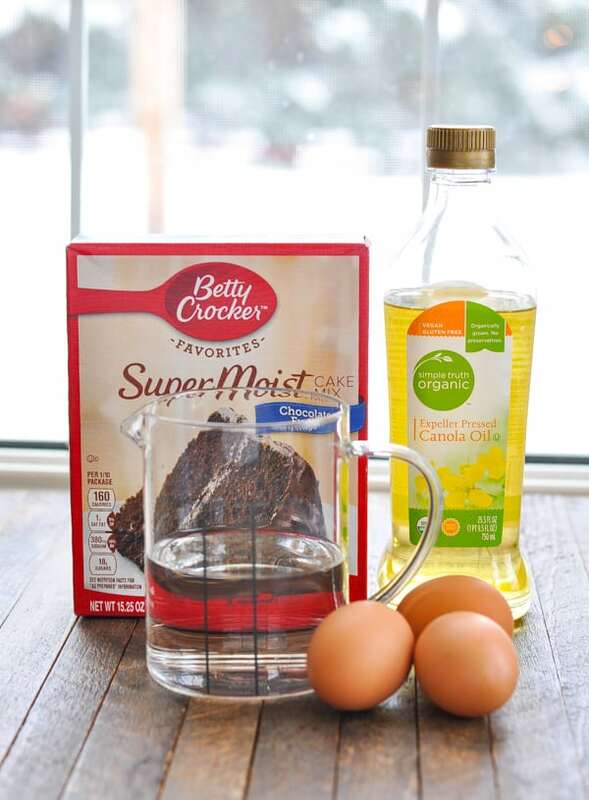 This Chocolate Italian Love Cake starts with a boxed cake mix for an easy dessert recipe that only looks fancy! This Italian Love Cake starts with a boxed cake mix for an easy dessert recipe that only looks fancy! 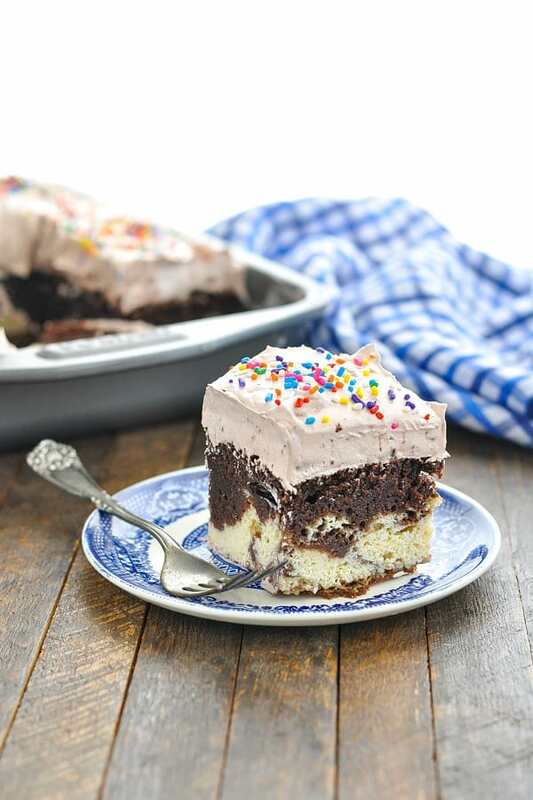 With chocolate, sweet ricotta and a whipped pudding topping, the layered Italian cake is moist, rich and perfect for Valentine’s Day, birthdays, or any other special occasion! I promise, though — you don’t really need an excuse to enjoy this delicious Italian Love Cake recipe! In fact, the boys and I whipped up this treat on a recent snow day — because baking seemed like a cozy thing to do while we were all housebound. No holiday, no birthday, just a fun way to spend time together in the kitchen! 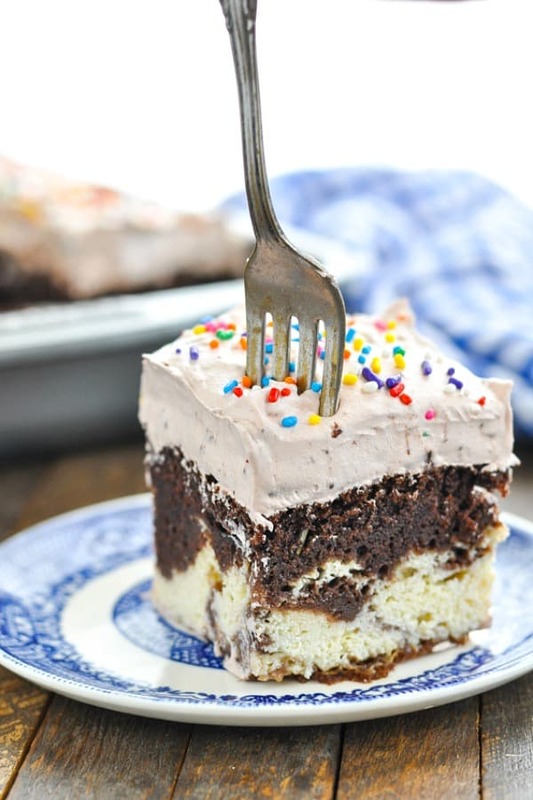 My friend Kristin originally shared this recipe with me, since it’s one of her kids’ favorite cakes. She knew that we would probably love it as much as her crew, and she was right! It’s one of the most moist and flavorful cakes that I’ve ever made! What is Italian Love Cake? 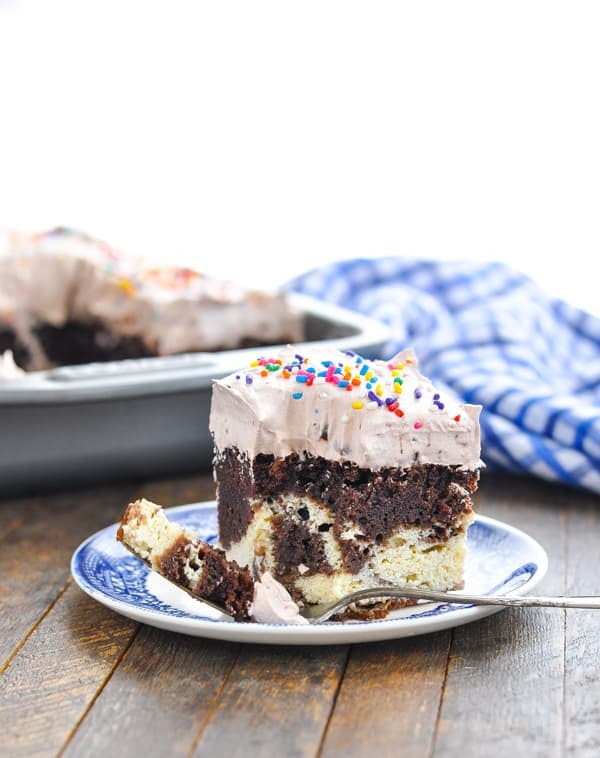 Like a cross between chocolate cake and cheesecake, this special dessert includes layers of chocolate cake, sweet ricotta, and a creamy chocolate pudding topping. 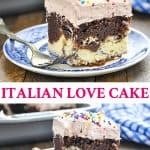 Why is it called Italian Love Cake? I don’t know the full history of Italian Love Cake, but from what I’ve read, this special treat is called “Love Cake” because it was traditionally served at weddings. First, let’s start with the chocolate cake layer! You’ll need a box of chocolate cake mix, as well as the rest of the ingredients called for on the package. I used this mix, which required 1 1/4 cups water, 1/2 cup oil, and 3 eggs. Check your box, though, to make sure that you’re using the correct additional ingredients for your particular mix. 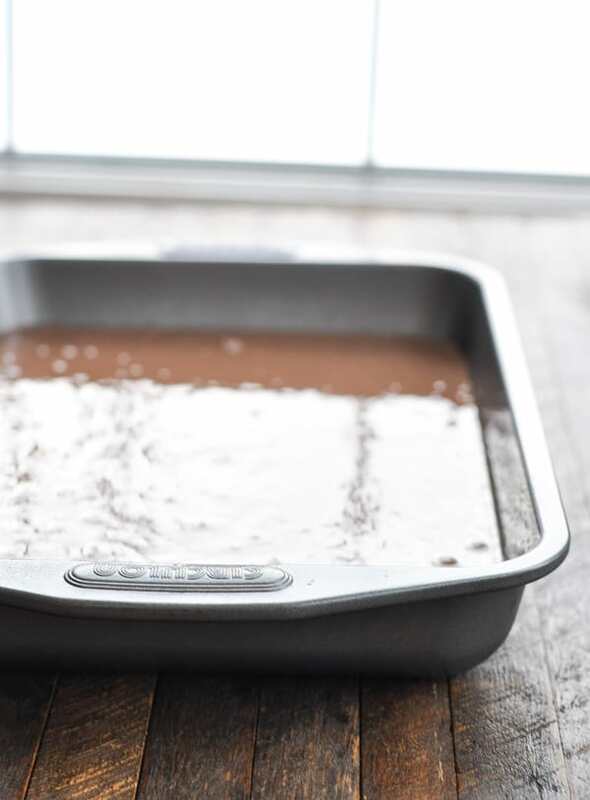 Prepare the cake batter according to package instructions, and pour it into a 9 x 13-inch baking dish. Set that aside. Next, it’s time for the ricotta layer! You’ll need a giant tub (2 lbs.) 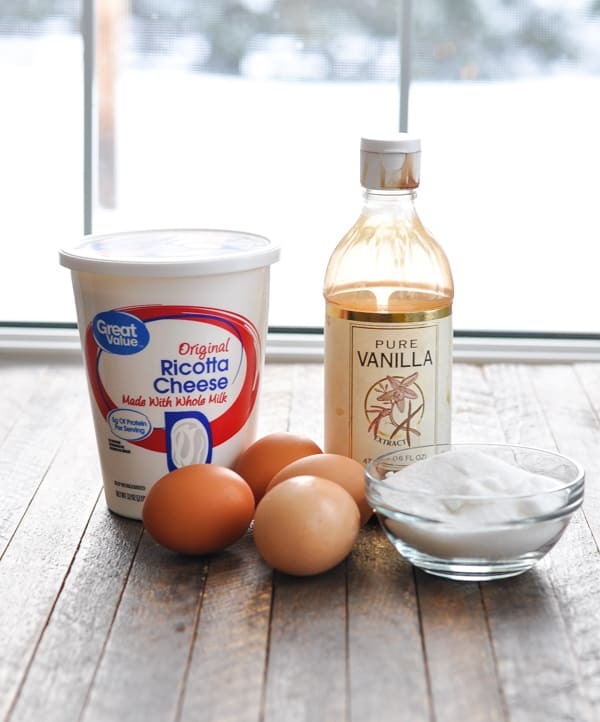 of ricotta, sugar, 4 eggs, and vanilla extract. Carefully pour the ricotta mixture over the cake batter. Spread evenly to cover as much as possible. It’s like magic! After 1 hour in a 350 degree F oven, the layers will “switch” and the chocolate will be on top! Once the cake is completely cool, prepare the topping. 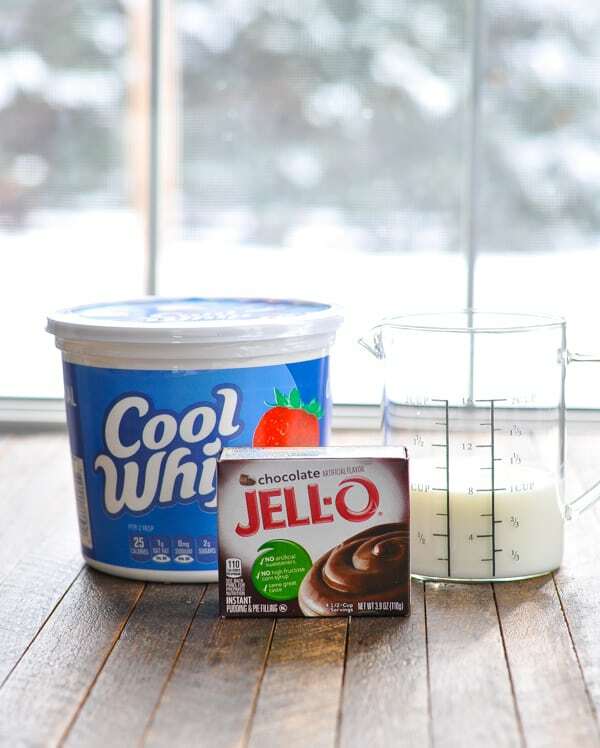 You’ll need a box of instant chocolate pudding mix, frozen whipped topping that has been thawed in the refrigerator, and cold milk. 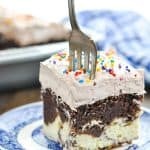 Fold the pudding together with the whipped topping and you’ll have a fluffy, chocolatey frosting to finish off the cake! Finally, I always add sprinkles on top, but that step is totally optional! Does Italian Love Cake need to be refrigerated? Yes! This cake tastes best after it has been refrigerated overnight. If you have leftovers, you will need to keep the cake refrigerated (or the topping will “melt”). Can Italian Love Cake be frozen? I haven’t actually tried freezing this cake, but I do believe that it should keep fine in the freezer. Just make sure that it’s wrapped tightly to prevent freezer burn, and enjoy the cake within 1-2 months. Prepare this cake at least 1-2 days in advance, so that you have plenty of time to allow the cake to cool and chill before frosting and serving. The cake just gets better as it sits in the fridge! 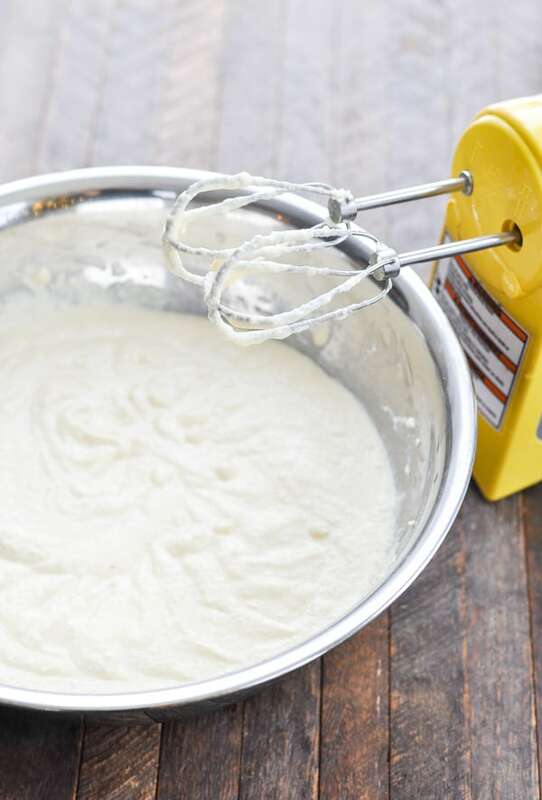 Check your box of cake mix to see which ingredients are required to prepare the batter. Different brands require different ingredients. When adding the whipped topping into the pudding, be sure to carefully fold the ingredients together. 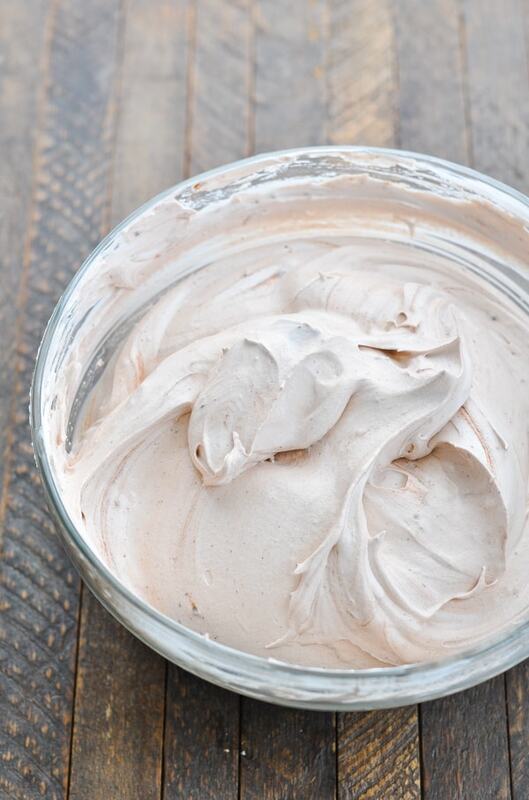 You want to preserve as much of the air in the whipped topping as possible, so do not vigorously stir. Vanilla Italian Love Cake: use a white cake mix. Use a box of vanilla pudding for the topping. Lemon Italian Love Cake: use a lemon cake mix. Use a box of vanilla pudding for the topping and add plenty of fresh lemon zest to give the topping a bright citrus flavor! Strawberry Italian Love Cake: use a box of strawberry cake mix. Use a box of vanilla pudding for the topping. Garnish with fresh sliced strawberries just before serving. Recipe courtesy of "Little Chefs Camp" at the Virginia Discovery Museum. Yes! This cake tastes best after it has been refrigerated overnight. If you have leftovers, you will need to keep the cake refrigerated (or the topping will "melt"). I haven't actually tried freezing this cake, but I do believe that it should keep fine in the freezer. Just make sure that it's wrapped tightly to prevent freezer burn, and enjoy the cake within 1-2 months. This recipe was originally published in October, 2015. It was updated in January, 2019. Thanks, Gayle!! It was definitely delicious (and gone quickly)! that cheese! wow, i am so in love with this layering! you are one fab baker! OMG!!!!!! I’m seriously drooling over this. And SO EASY. You amaze me! Pinning this and making it for the next get together I have! So, so in love with this cake! So gorgeous, and so delicious!! 🙂 Pinned! Do you mix the 4 eggs in with the ricotta cheese?? 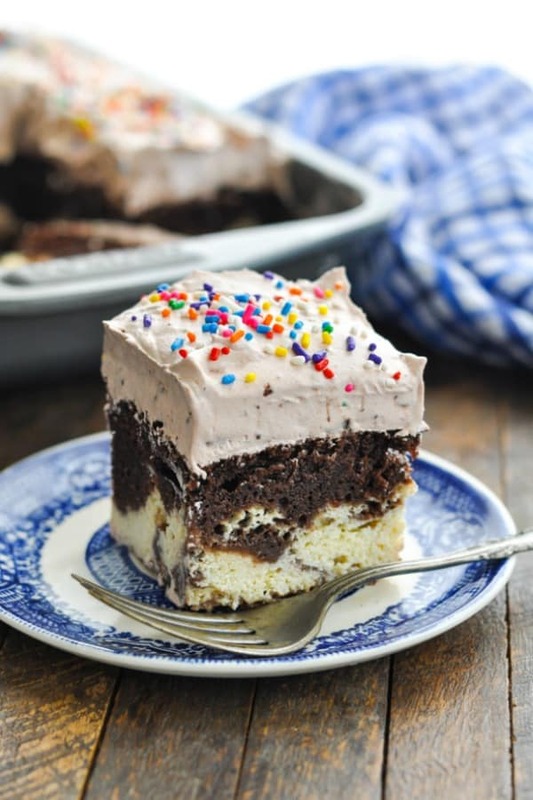 Would I be able to bake this in a round springform pan? Hi, Sabrina! Since the recipe uses a 9 x 13-inch pan, you would need a round pan that is equivalent in size. That would have to be a very large round pan (or you could make two separate smaller pans) because most round pans are about 8 or 9-inches in diameter. If you use one smaller round pan, then you will just need to cut the ingredients in half because you will have twice as much batter, filling, etc. as will fit in the pan. What kind of flavor does the ricotta have in this cake? I am familiar with the savory ricotta in lasagna, but thinking that it takes on more of a cheesecake like flavor with that many eggs and sugar mixed in. What is the texture like with that many eggs? Thanks! Hi! Can I make this the day before an event? Will it still taste fresh after a day of sitting in the fridge? This cake was very easy to make. I halved the recipe for two. It was delicious but next time I will put more sugar in the ricotta layer. It wasn’t sweet enough. I’m glad that it worked for you, Kathleen! You’re right — the ricotta layer isn’t very sweet, so more sugar would be a great addition if you prefer a sweeter filling! 🙂 Thanks for your feedback! I made this cake over Valentine’s Day. It turned out great. Just wanted to know if I need to warm up the milk into the pudding before adding the cool whip. Mine had little crystals into the cool whip topping. I also baked it in a non-stick metal pan. Baking time was a little less. Hmmmm…I don’t think that you want to warm the milk, Connie. The Cool Whip would melt and deflate if it got too warm, so I wouldn’t try that. I’m not sure why you would have had the crystals in there. Maybe it just needed to be whisked with the milk even more so that the pudding was completely dissolved before folding into the Cool Whip? That’s my best guess. 🙂 Glad that you enjoyed it! Hi, can I use regular cream cheese instead of ricotta cheese? A friend made this cake an it is totally yummy, so I had to make it for my family. After an hour in the oven, the cake has alot of movement in the middle. What are your indications that the cake has baked long enough. Bounch back to touch or clean toothpick in the center? I think that my oven temp is good. Can you use cottage cheese instead of rigcotta? Hi, Jane! I don’t think so…although I haven’t actually tried that substitution. Ricotta has a different texture than cottage cheese (much thicker and firmer), so I would worry that the inside of the cake wouldn’t set if you use cottage cheese instead. One question, are the 4 eggs listed including the eggs used in cake mix or is it 4 eggs mixed with the ricotta cheese? Someone earlier said that they tried Devil’s Food and it didn’t work. Well, it worked great for me! This cake was easy and perfect and looked EXACTLY like the photo (down to the adorable sprinkles!). It’s a perfect combination o dense and rich and light and fluffy. The best o all worlds! All of my party guests were amazed. They kept asking, “Did you make this! ?” as i I were some master chef for ever being able to make such an intricate dessert. I guess this will be my little secret. Thanks for sharing this recipe. This is the kind of thing that usually remains a secret. Hi, Ashley! I’m so glad that it worked well for you and that you enjoyed the cake. We love it too! I like the presentation of the three layers, Blair. I particularly like creamy cakes, which yours are. Could I half the ricotta cheese portion of the recipe? That’s a lot of cheese and eggs ! I am sure I would have to adjust the baking time, and the layer would be thinner, but I am ok with that? Your thoughts? We enjoyed this so much! So simple and refreshing. The key is to let it cool completely then frost. I let it sit for a good six hours and it was perfect. Hi, Kim! That’s great! I’m so glad to hear that it was a success! Love this cake. Made it for company. It was easy. I remember this cake from my grandmother. Love this cake. I remember my grandmother making this cake. Do you have to drain the cheese? Can you substitute cream cheese in place of the ricotta? Somehow I picked up brownie mix and not choc cake and didn’t notice until it was mixed. It’s in the oven now, cheese still on top and over an hour. Fingers are crossed. Think it’ll work? 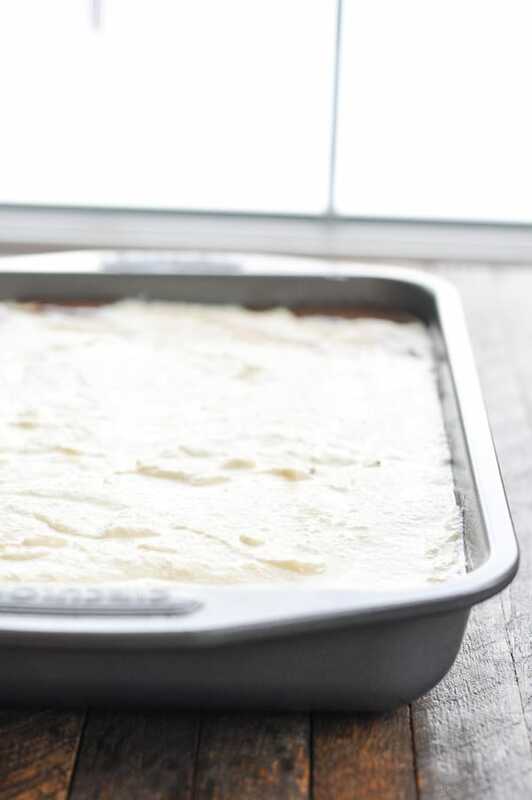 Has anyone tried making this on a cookie sheet…like a sheet cake? Hi, Laura! I have not personally tried it that way, and I’m not sure if any of the readers have. Sorry I’m not more helpful! My layers didn’t turn out so “layered” there was chocolate cake on the bottom and on the top with the ricotta in middle ? That’s what it’s supposed to be like! does the icing need to be on for 6 hours or does it go on before serving ?? Hi, Pepper! Yes, the icing goes on before chilling. It’s best to have the icing on for the 6 hours (or more) while the cake chills in the refrigerator. You don’t want to add it at the last minute. Hope that helps, and enjoy! I first had Italian love cake at a little cafe in a small town. And I fell in love! I am not a cake person but this one changed my mind. Today is my first time attempting to make it myself, using this recipe. It is currently in the oven, but the 9×13 pan seemed quite full, I’m worried it may overflow if it rises too much. I put a baking sheet on the rack underneath just in case… Has anyone had a similar experience? It did not overflow but I did have to cook it for 25 min longer. Can you use fresh heavy cream instead of cool whip? I made this phenomenal cake for my daughter’s birthday. Only change I made….found out at last moment I did not have any chocolate pudding. And vanilla sounded a bit plain for a birthday, her 38th, so I used 1/4 cup kahlua and 3/4 cup milk with vanilla pudding mix. Then followed your directions to a tee. Oh I did crush some instant coffee to pure powder form and lightly dusted the cake one hour before serving (I put the cake back in the fridge for final hour). I did the coffee dust that way so it would marry with the topping a bit and not be give a bitter in your face aftertaste. This was a HUGE hit! Thank you so much for posting this recipe. It is officially the only cake she wants for her birthday. I’m curious. I’m a lemon freak. For the lemon version, I’m wondering about lemon extract instead of vanilla in the ricotta layer and/or lemon pudding in the frosting layer. I would think lemon flavor in the cheese layer would be great. Just lemon cake doesn’t sound too lemony. I’m anxious to try it. Let me know how it turns out! I want to try that, too! This is the 2nd time I made it but this time my layers didn’t switch during baking.? Not sure what happened this time? This is one awesome dessert. I have made this awesome dessert for my church potluck, bible study group, and Prison Ministry group. My 9X13-in baking was cleaned out, There wasn’t any left over. I went to make the cake again for my wife’s family but I didn’t have chocolate mixing. Had lemon cake and lemon pudding wal la add tablespoon fresh lemon juice and zest from one lemon. Add lemon zest to frost also.Some of the cake was left over but I wasn’t able to take them home, I high jacked at the door. The next day the lemon flavor was even better than the first day. Waa hoo!! Thanks this recipe is very versatile to make with flavors. Thank you for this big hit..
That’s wonderful!! Thanks, Charles! I bet the lemon version was amazing! Hi! No, I haven’t tried it with the cream cheese, and I haven’t heard from anyone else who has. Cream cheese has a different texture than the ricotta, so I’m not sure how that layer of the cake would turn out. in your recipe you never say to remove the cake when done out of the baking pan do you leave it in the pan and then frost?